These cotton knee socks are sold as a pack. Two pairs of socks in a pack. 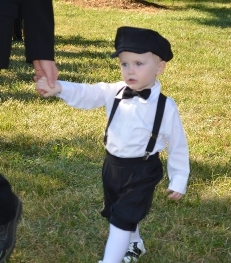 A classic cotton knee sock to wear with knicker suits, ring bearer shorts sets and christening outfits. Socks size infant 4-5 1/2 fits infants 6 to 12 months, shoe size 1-4. Socks size xs 6-7 1/2 fits ages 2-4 years, shoe size 3-7 and s 7-8 1/2 fits ages 3-7 years, shoe size 9-1. Ships in 1 day unless combined with other items that require more time prior to shipment as stated in the product description. The price is for two pairs of socks.